We were waiting in line with the tour groups for breakfast to open at 7 this morning. The buffet was pretty good and I’m guilty of eating no less than 3 warm fresh cinnamon buns. The music ensures a festive atmosphere despite the hour and we heard The Bangels “Walk Like and Egyptian,” playing over the radio. We headed straight for the Old City entering through the Zion Gate, upping the calorie count by stopping at the Marzipan Bakery (thanks Miryam) for more goodies. The city was eerily quiet in the morning. We were about to see where everyone had gone as we headed down to the Wall. As this trip loomed on the horizon for all those weeks, months, years, it has always been about one thing: the Wall. 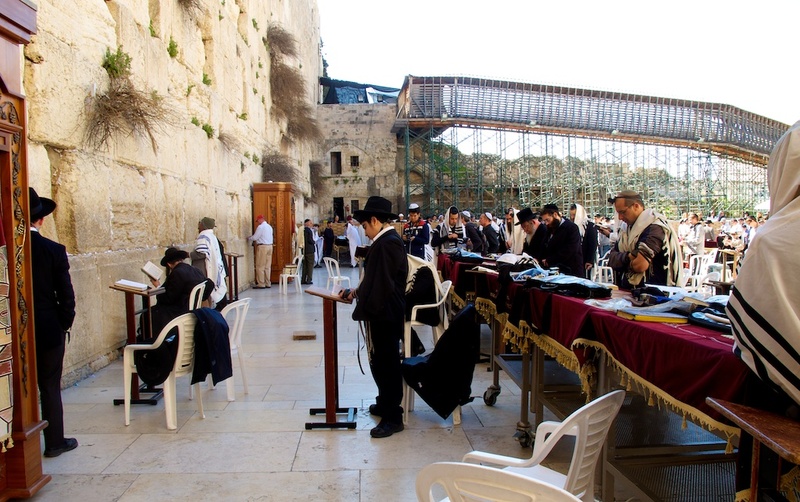 “No Jewish shrine is holier than the Western Wall, the remains of the ancient Second Temple compound, whose stones are saturated with centuries of prayers and tears.” I’ve heard many stories which left me eager for my own. First, we’d have to pass through security. We saw a few different entries, some with short almost non-existent lines, one extraordinarily long: I’d say at least 100 yards, choked with people and moving at a snails pace. As I paused to try and figure out how such a system worked, and how we might avoid it, Jamie, fearful of my cunning ways, grabbed me by the arm and said “You’re coming with me,” and pulled me towards the back of the line.” Apparently this was the ‘boys & girls’ line and my wife was not down with cutting…not that I would be either in such a place. So, we waited. And waited. One tour guide announced a 2 hour wait and exited his flock. 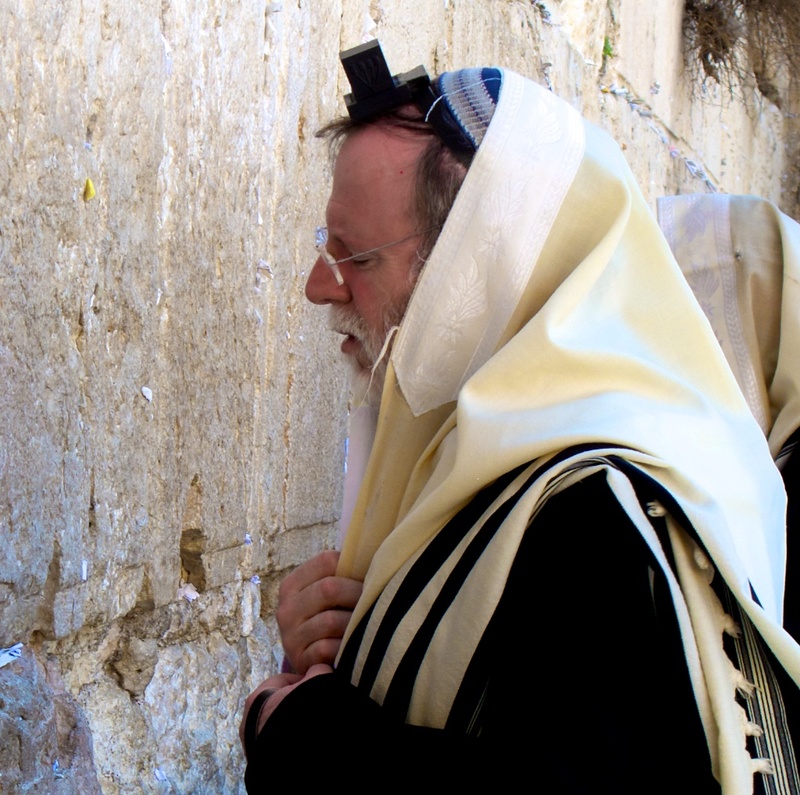 I decided to go investigate and it turned out we were waiting in line for the Temple Mount – not the Wall! Jamie is never going to hear the end of this one. So the mood was light for a moment as we breezed ahead and through the correct security, entered the wall complex and learned that men and women were to pray separately. It wasn’t always this way–we saw photos of integrated prayer from the 20’s, but it is now. I respect tradition, but wish that I could’ve shared the experience with wife. In my excitement this barely registered as [a self conscious] part of me was glad for the privacy. 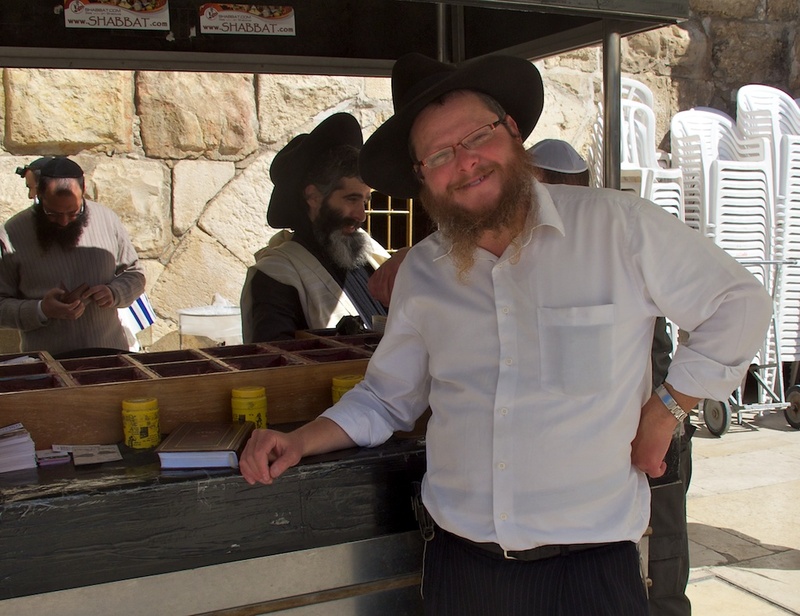 I was immediately approached by a kind man from Chabad who walked me through the blessings and wrapped me in Tafillin. My Great Grand Father H.B. Foreman laid Tafillin every morning. I haven’t done so since the morning of my Bar Mitzvah. Standing in the omorning sun, facing the wall, wrapped, singing the Shma, then the Vehafta is something I will not forget for the rest of my life. I felt a part of my tradition, grateful for the years spent in Hebrew School and the hours by my fathers side as he taught me to read Hebrew. I walked around the prayer area and it was amazing. At a given moment, there were at least 10, or maybe 20 different services going on. There was also a cave with a library and more prayer. Bar Mitzvah’s celebrating, minions, torah readings, Kaddish; all different emotions flooded the place. This was a major departure from the monotony and muted misery of the temple I grew up in; filled with stand-up, sit-down, when do we get to leave? There was so much happening and such devotion to the prayer and worship. I was overwhelmed and felt a tear come to my eye as I placed my hand on The Wall. Centuries. 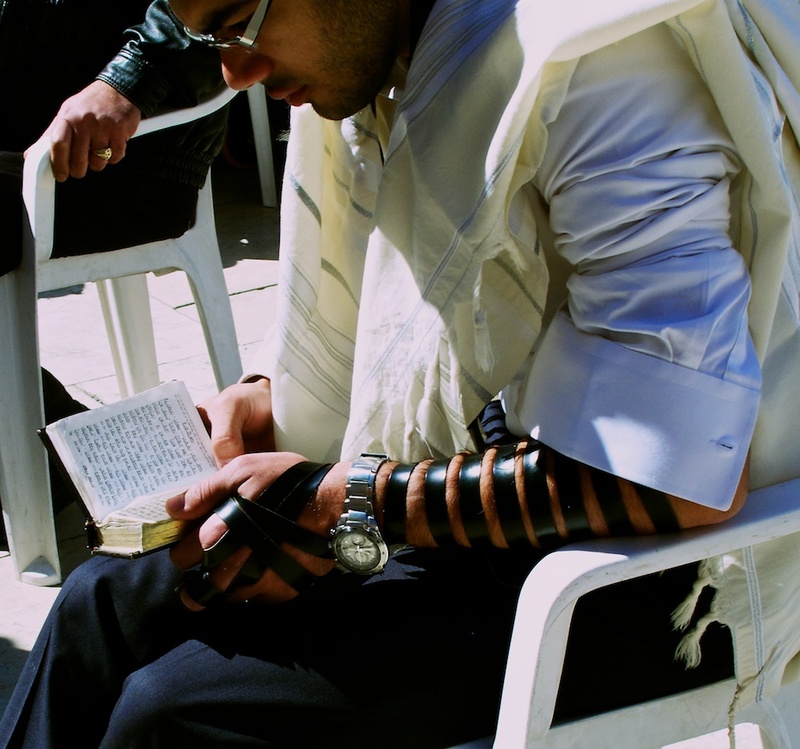 As they unwrapped me at the Chabad, the kind man told me “You should do this every morning.” How could even explain to a man who has dedicated his life to worship, that I don’t even have 5 minutes? Not that I couldn’t, but wouldn’t. It felt uncomfortable for me to be commanded. They laughed as I told them how my Tafillin hasn’t been checked for 18 years. “At least you are honest…” All the same, I will love them for sharing this with me, and I happily stuffed my donation into the box. Jamie was waiting for me as she’d handled her duty of depositing a paper with all requested names and prayers in the Wall and found little else to do on the women’s side, which was clearly lacking in any sort of excitement, aside from standing on chairs, peeking into the men’s side. I was happy to be reunited with her as we were about to walk in Christ’s footsteps on the Via Dolorosa. What an amazing range of emotions. The old city leaves you with a very special feeling. Not so much religously, but the feeling of zionisim. A connection to the state of Israel. We have been chased from the very spot you were standing today for 1000’s of years. And today you can stand there in a free place, with out the persacution. The state of Israel is less than 65 years old. I am so glad that you are there experincing this. Reading your comments is moving. Enjoy every minute. I love reading your comments and hearing about your journeys!! Keep writing..it’s wonderful to read! Much love to Jamie! your stuff is great!!! Enjoy. I was so moved reading your blog and seeing the pictures of The Wall that I felt I was right there with you. There were shivers going through my body when I saw the pictures. You make me want to visit Israel myself. Thank you for sharing and keep on blogging. P.S. Can’t wait to see you Saturday.